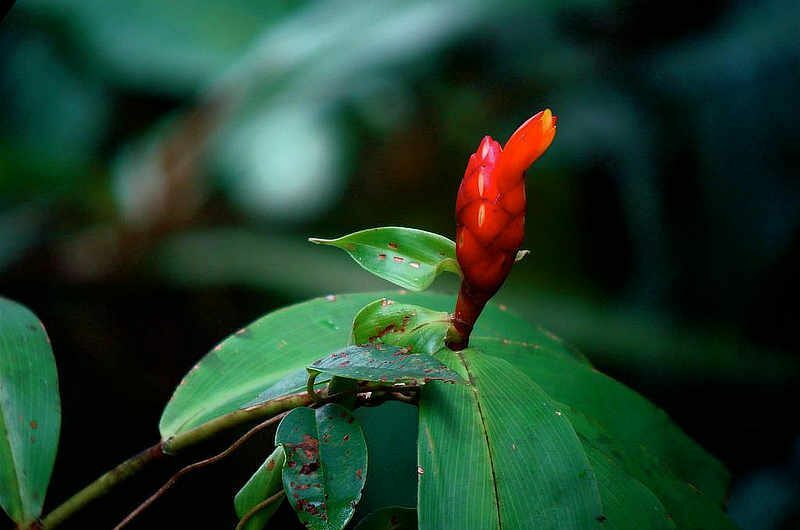 Rough Ginger, also known as Indian Head Ginger, is one of the “spiral-gingers” of the genus Costus, named for the way that the leaves wrap around the stem. This plant forms an orange cone on the top of the stem, and orange tubular-shaped flowers emerge one or two at a time from the bracts of the cone, each lasting one day only. The flowers have no fragrance but are edible, have a crunchy texture and make a nice addition to salads. The plant grows 4-6 feet tall, and cones of the Rough Ginger can grow to a length of 8 inches. It is native to Central and South America and grows in warm lowland climates. Rough Ginger grows in the gardens and open areas surrounding the Canopy Tower and Canopy Lodge.